Over the last week, Marketers have had their RSS, LinkedIn and Twitter feeds exploding with dozens of posts about a single tweet. The tweet took 45 days of planning from an agency copywriter, designer and a team of strategists before only pumping out two favorites (Twitter for likes) on launch day; there were no immediate retweets (shares). 1) The process did NOT dominate 45 working days. The media really honed in on the project timeline for one tweet. Here’s the thing, 45 days at an agency does not mean 45 full working days fearlessly dedicated to hashtags about cheese. It takes team meetings, emails to colleagues and clients, maybe a client presentation and days or weeks spent waiting for approval or feedback on headings, photography and artwork. It’s not the kind of action that had us all burning through another half season of Mad Men this month. A lot of time is spent… waiting. Yesterday The Wire broke a story on how long the tweet actually took to create, and the staff described a few team and client meetings before taking the message and visual to Twitter. 2) Metrics matter, but time does too. In less than a month, this tweet has added up to 154 retweets and just under a thousand faves. Everyone is obsessed with metrics, but any campaign needs to be measured over days, weeks, months or a business quarter, not just over 24 hours. (Yes, even on Twitter.) Of course the media attention gave this tweet a positive injection, but the point is, even if the ROI is there it isn’t always instant. I know, I know, with our digital strategies in full gear we’re all focused on page visits, campaign opens, clicks and conversions, and of course, we should be. But Content Marketing isn’t all about leads acquired; it’s about building brand recognition and a powerful dialogue that helps consumers know and trust your brand. And brand recognition isn’t something that happens in five minutes and 140 characters. Even with the not-so-positive barrage of articles and blog postings, most readers reacted by taking to Twitter to visit the company’s feed. This added to faves and followers, (and yes, retweets), but also this boosted brand recognition. I had never heard of President Cheese till a week ago. Now I know exactly who they are and that their cheese is best when shared and at room temperature. If you’re reading this, now you do too. And whether you agree with the President Cheese strategy or not, after visiting their Twitter feed chock full of warm, touchably sharp photos of brie with crackers or soft, full ovals of cheese, no one can deny that it all looks, well, delicious. President Cheese has really benefited from the recent media storm and their Marketing department, (or agency) has been able to roll with the punches. 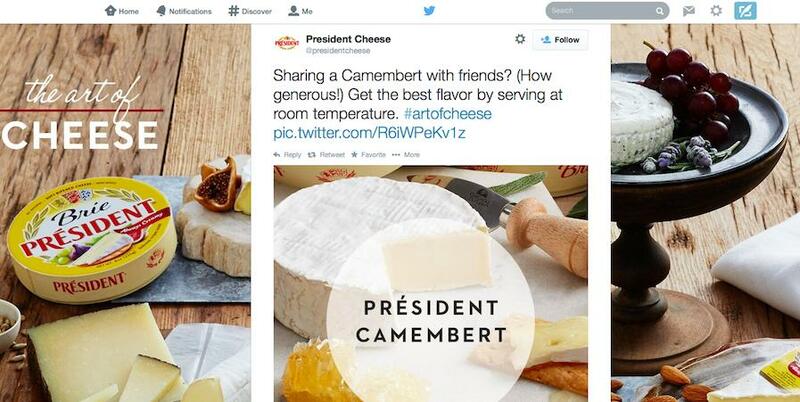 One of their tweets from yesterday cracks, “While our Camembert may take 45 days to age, this tweet certainly didn’t.” Oh, and for you metrics junkies, it’s already been retweeted 60 times. This entry was posted in Brand Identity, Branding, Marketing, Naomi Garnice, Naomi Rochelle Garnice, Social Media, Twitter, Viral Content. Bookmark the permalink.